Mazars Grange batsman Neil McCallum believes all the pressure is on title rivals Arbroath as the CSL Eastern Premiership season gets set for an exciting last day tomorrow. Arbroath sit top of the table and know that a win at Myreside against Watsonians would hand them the trophy. However, should they lose to ’Sonians – who are looking for their sixth league win on the spin – and Grange defeat Heriot’s then the trophy would head to Stockbridge. Former Scotland man McCallum, 37, is one of the few Grange players still in the first XI who were part of the side who won the ‘old’ SNCL Premier Division in 2010. As a result he is looking forward to being involved in last-day league drama and the Scottish Cup final against Arbroath on Sunday in Stirling. He said: “It has been a cracking season and although we slipped up against Carlton a couple of weeks ago we played very well against Aberdeenshire last week and still have a chance to win two trophies. “All we can think about tomorrow is making sure we get the win over Heriot’s and I think the pressure is on Arbroath because they are in the driving seat, but they have a tough match to play against Watsonians. “Watsonians have been playing some good stuff of late, so maybe they will do us a favour, but whatever happens we will be giving it our all until the last ball is bowled. Last weekend Grange’s George Munsey play against the touring Australian side for English county Northants. Many in the Scottish game believe the talented left-handed batsman can go on and earn himself a full-time deal down south for 2016 and McCallum said: “George has done very well this summer. He has come on a lot as a player and matured quite a bit and he has a lot of talent. 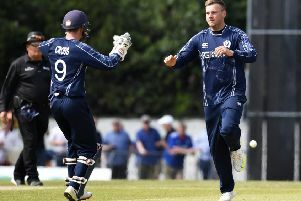 Elsewhere in the top flight tomorrow Carlton will be looking to finish with a flourish – and claim third place in the table – when they travel to Broughty Ferry to take on Autoecosse Forfarshire who won the national Twenty20 trophy last weekend. Already relegated RH Corstorphine will finish their season in the division with a trip to Falkland with the match likely to be the last outing for the Capital side for Australian duo Jake Marnie and Daniel Payne. In the Baillie Gifford ESCA Championship there are still a number of local clubs with important fixtures tomorrow. Murrayfield DAFS are already relegated, but Marchmont, Holy Cross, Edinburgh and Stuart&Stuart Penicuik are all after victories to secure their survival. Marchmont take on Penicuik at Cavalry Park with Holy Cross at SMRH and Edinburgh travelling to DAFS. In the East Leagues below the Championship most things are sorted out in East One, but in East Two and Three there are exciting weekends ahead. Morton know that a victory against Livingston would allow them to clinch the East Two title while in East Three the winners of RH Corstorphine II and Kirk Brae will finish top.